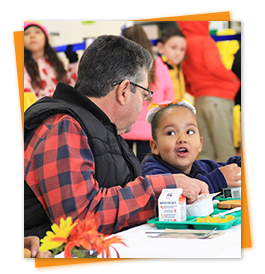 Good nutrition plays a key role in the healthy development of young minds and bodies, and at Santa Cruz Valley, we are committed to giving our students every opportunity for success and well-being. That’s why we provide healthy and appetizing meals that comply with USDA regulations and dietary guidelines. Welcome back! We hope you enjoyed a restful summer break. We look forward to another successful year at Santa Cruz Valley Unified School District #35. Our mission is to make each day a better day for our students, staff, and our community. Your voice is important to us. If you have any questions, please feel free to reach out to me via email. Bienvenidos! Esperamos que haya disfrutado de un tranquilo descanso de verano. Esperamos con anticipación otro año exitoso en Santa Cruz Valley Unified School District #35. Nuestra misión es hacer que cada día sea un día mejor para nuestros estudiantes, nuestro personal y nuestra comunidad. Su opinión es importante para nosotros. Si tiene alguna pregunta. No dude en ponerse en contacto conmigo en correo electrónico. In an effort to care for our environment and avoid wasting paper by printing unnecessary duplicates, we make hard copies readily available in each school office and no longer send printed menus home with each of our students. Instead, we encourage you to visit the Sodexo website to download and/or print the monthly menu at your convenience. Using the MealTime Online website, you can make prepay deposits and payments on balances for your student’s school lunch account. You can also view your student’s account activity, including onsite payments, online payments, current balance, and a detailed history of meal and food item purchases. Please note that there is a small website use fee for using the MealTime service to make your deposits. This fee will be displayed on the website prior to payment. To learn more, visit MealTime Online. If you’d like to get started using the MealTime Online service, please contact Luz Valdez at (520) 281-8282, ext. 8445. The Alliance for a Healthier Generation created a tool to assist in determining whether a snack is healthy.